As one of the last happily single members of her circle, I'm probably the least wedding obsessed of all of my female friends. However, in addition to Speed Racers, Iron Men and Indiana Jones, this May at the box office, audiences are inundated with films about couples going to the chapel. In honor of the trend and as a romantic realist whose favorite stories seem to be the ones about what happens BEFORE a couple hits the altar, I thought I'd highlight my love of romantic comedies by finding one surrounding a wedding that managed to get... oh, EVERYTHING RIGHT. 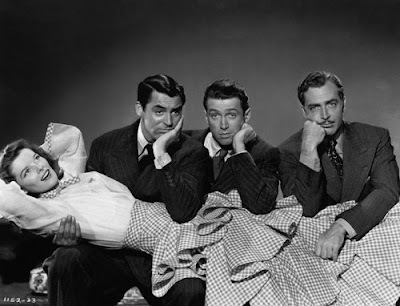 Click here to explore two of the best scenes from one of my favorite films, The Philadelphia Story, which is the subject of this week's Take Two on the Film Intuition Home Page. And the best part is, no invitations, gifts, tacky bridesmaid dresses, or Lionel Ritchie songs are required!